Worried About the Health of Your Business? Provides Full 360 Degree View of Your Business So You Can Make the Absolute Best Decisions Going Forward! Focuses on Management Decisions Instead of the Numbers That Result from Those Decisions … So You Get a Clear Picture of How Your Business is Doing! Benchmarks Your Business Against the Best Performers in Your Market so You Really Know Where You Stand! It’s easy to get lost working IN your business. There are so many things to do that you have little to no time to look at the big picture and plot a plan for future growth. Often, successful larger businesses end up asking highly paid professional consultants (like me) to come in and provide a clearer picture of how the business is doing and what it could be doing better. But this is often not a viable choice for small and medium-sized businesses – SME’s. So how do you find out if your business could be performing better, how do you check your performance against your competitors, how do you get the information you need to plot a plan for future growth … and how do you do all of those things without spending a fortune or dedicating all your time to this task at the expense of other vital areas of your business? That’s right, I’ve created a business analysis program that completely automates the management consulting process – while also shortening it to just 90 minutes! Now you don’t have to meet with a high paid consultant or rely on software that provides only a partial view of your business (leaving you to fill in the rest with guesswork and opinion). The online program is fully automated so all you have to do is answer the questions in the secure questionnaire, which will take approximately 90 minutes to complete. Upon completion of the questionnaire, the program will immediately analyze your answers and deliver a comprehensive yet very easy-to-follow report that will let you know exactly how your business is performing in 28 key areas right now, how you stack up against best business practices and what you can do to maximize profits in the future. In other words, this report will contain all the recommendations you would get from a human consultant over an expensive period of several weeks and you’ll be getting them all in about two minutes (after you complete the questionnaire). There is no easier, no faster, no cheaper way to get a full analysis of your business! You no longer have to rely on your own judgment about how your business is performing! You get a thorough expert assessment that will show you the most efficient route for future growth! The report even contains a “traffic light system” so that you will know where your business is weak and in need of fast attention! It’s the Ultimate Prescription for Business Health! One of the major deficiencies of other business analysis software programs is that they focus on one specific area, such as financials or marketing, and they don’t provide a full 360-degree view of a business. This limited focus can cause you to draw the wrong conclusions about your business. For example, if you look at marketing in isolation, you may overlook that the underlying reasons for poor performance in this area may be poor management or a small budget. How’s My Business Doing focuses on how your business is managed – giving you the clear, full 360-degree picture you need to optimize performance and maximize profits. Many of our clients have told us that our program produces a report that is a “charter” for how they should be running their business with recommendations and standards they can implement over time for better and better performance. Our program has also proved to be an early warning system for businesses that are getting into trouble. the Real Health of Your Business! We want to encourage lots of clients, who are hungry to significantly improve their business performance, to engage with us and get the benefits they deserve without it costing them an arm and a leg. That’s why we have deliberately priced How’s My Business Doing at a low price that any business can afford. Plus, if you want to take advantage of our international business management experience, and use us as a direct sounding board or as an implementation partner for your business, we are happy to do that too. Remember, every successful business entity – whether start-up, second stage or mature – must consistently and frequently use an evaluative process for measuring performance. It should also have a realistic business plan to help guide it forward. Planning in a meaningful way requires a baseline and ongoing evaluation and course correction. How’s My Business Doing delivers a solid evaluation process and a baseline that you can trust. Our program will even reflect back on how you answered certain other questions and challenge you if you are inconsistent. In essence, we provide an alternative to traditional management consulting for small and medium businesses, at a price they can afford. It is totally unique and really simple to use. Our final report is usually 50 to 70 pages and it features a “traffic light system” so that you can quickly identify what needs immediate action, what needs to be done when you have time, and what can be left alone for now because it is working perfectly well. 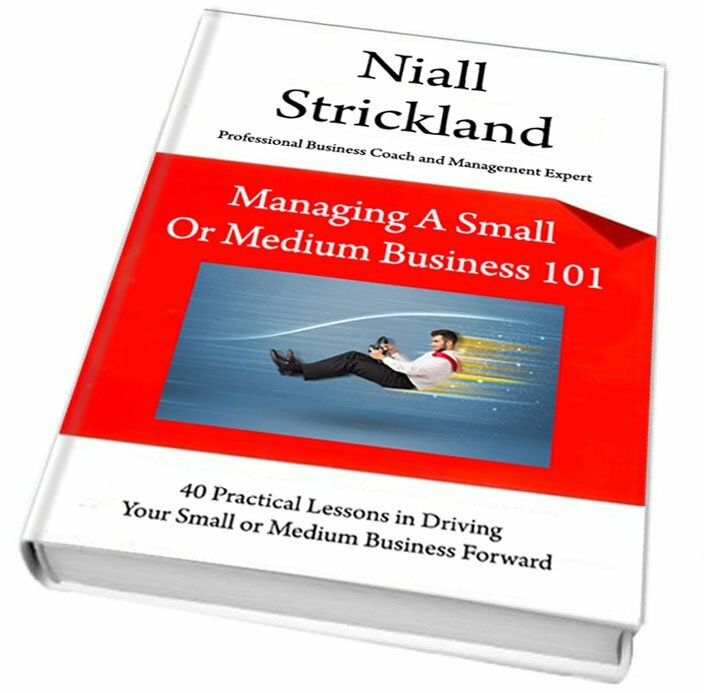 If you buy during this month, we are offering a free copy of Niall Strickland’s new eBook “Managing A Small Or Medium Business 101” – 40 Practical Lessons in Driving Your Small or Medium Business Forward. No financial questions are asked on our questionnaire so you do not have to be concerned with putting sensitive competitive numbers online! We also offer the ability to re-take our questionnaire periodically for just $50 so that regular measurements of progress can be taken. A new, different report is issued each time! Don’t delay, instantly check the health of your business and begin plotting an even more profitable future with How’s My Business Doing.